© 2012 by Nicola Winters; All rights reserved; content may not be copied, rewritten, or republished without authors written permission. With the recent slump in property prices, many families are choosing to improve on their existing house rather than buying and selling. As families expand, work commitments change and personal preferences alter; people are forced to create more space within the home. There has been a recent increase in the amount of people investing in home extensions as a solution to the problem. However, these can be expensive and unrealistic for many families. 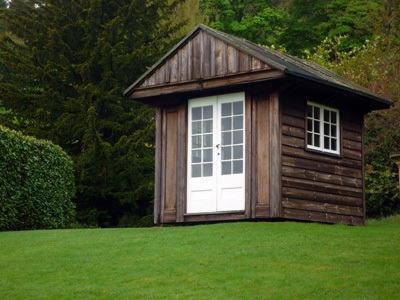 A cheaper and more convenient alternative is to convert a garden shed into an additional room. The amount of tradesmen that are choosing to work from home is increasing every year, however the space needed for them to conduct such messy work is rarely seen inside homes. By transforming a shed into a workshop, those who are working or just practising their hobby, can have the freedom and space to work to their hearts content without fear of damaging furniture and objects around them. Projects, tools, and equipment can all be stored safely and securely, out of reach of children. Many people choose to include a study in their homes. Although this is a great idea, a full room must be spared, meaning other rooms in the house have the potential to become cluttered and over cramped. Having an office in a garden shed can actually bring many advantages. Homes create plenty of distractions that can disrupt a person's concentration and interfere with their work. A garden shed will allow for complete privacy, peace, and quiet. Simply set up a broadband connection, install your computer, printer, fax, and phone and youll have a home office that beats any brick and mortar cubicle. For practising bands and musicians, or just those who have a huge collection of albums, a garden shed is perfect. Not only will music lovers be able to play to their hearts content without disturbing those relaxing in the house, but also have the space and freedom to set up musical equipment permanently, in the same place. Garden sheds dont just have to simply be a place to store your unwanted furniture; they can be created into something special.